It has been awhile since I last posted as I have been away teaching in TX and Florida this month. Thank you to The Crafty Scrapper in Waxahachie, TX and Whim So Doodle for letting me teach a few classes! I am lucky that my sister Patty lives in Fort Worth, TX and travels with me to these two stores. She helps me keep all the balls in the air while I'm teaching! It has been such a huge blessing to have her come with me on these trips as my sidekick! Well let's get to today's project! 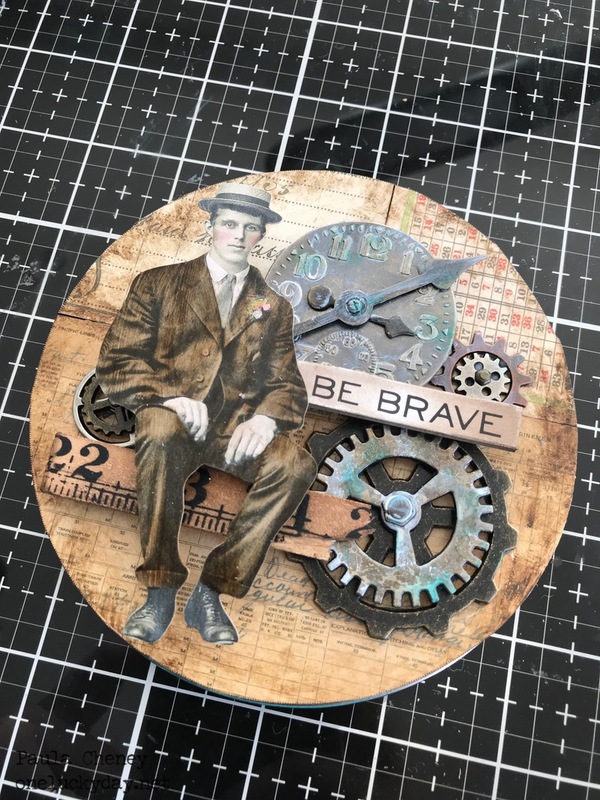 I'm excited to share the Assemblage Clock I created using the new Sizzix 3-D Mechanics Texture Fade. 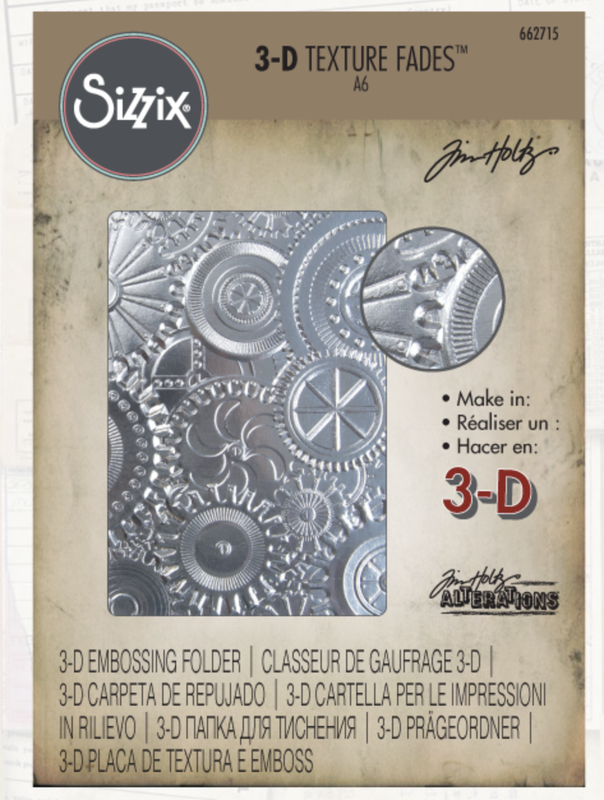 The 3-D Texture Fades Embossing Folders offer the deepest and boldest dimensional embossing. 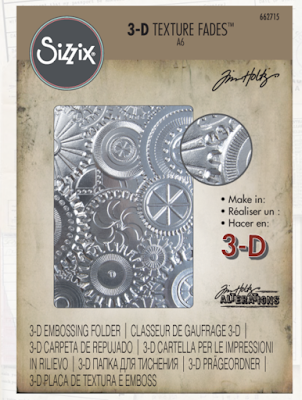 Sizzix 3-D Texture Fades Embossing Folders are for use with the BIGkick, Big Shot and Vagabond machines only. There are currently 4 different designs available. If you haven't used a 3-D Texture Fade the best place to start is this post on Tim's blog. The short video is great for getting started...like, How many cutting plates to use? How many times you need to run it through the Vagabond or Big Shot? and why in the heck would you need a spray bottle? All these questions and more are answered in the video. Tim also followed up the first video with a second one giving more tips and tricks - you can see that here. 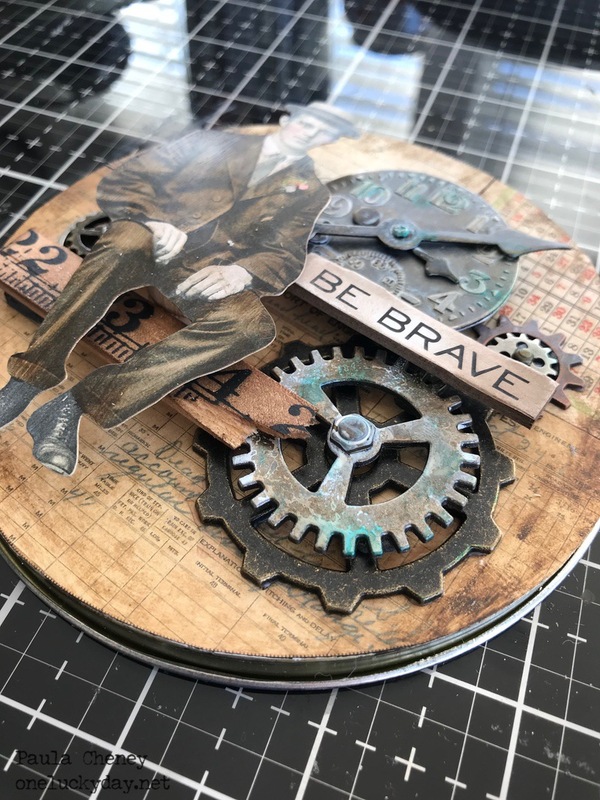 For this particular project, I used Tim Holtz Alcohol Ink Foil Sheets to cover the outside of the clock body and bells (I like it not only for the metallic look, but it's self-adhesive). To do this, I ran 4 separate sheets of foil through the Vagabond - this was enough to cover the outside of the clock. Please note: Because I am using thin foil I only needed to run each sheet though the Vagabond once to get the impression and also I did not need to spray it with water - that is only for paper. I painted the foil sheets with Ground Espresso Distress Paint, wiping away the excess. 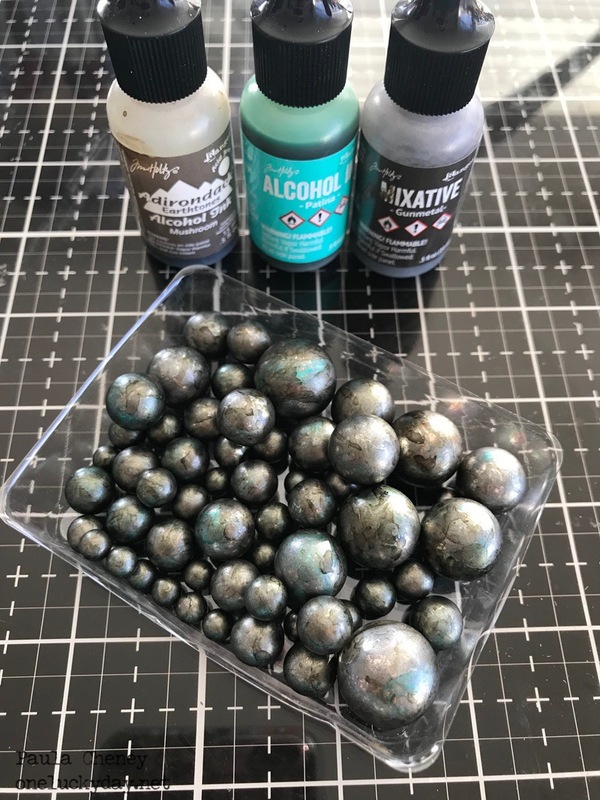 Once the paint was dry, I lightly sanded the raised surface details, then randomly wiped Gunmetal Alcohol Ink over the raised texture. I like to work all 4 sheets at the same time - meaning I paint them all, then sand them all, etc. I find that its easier to make all 4 sheets look the same if the process is done this way. 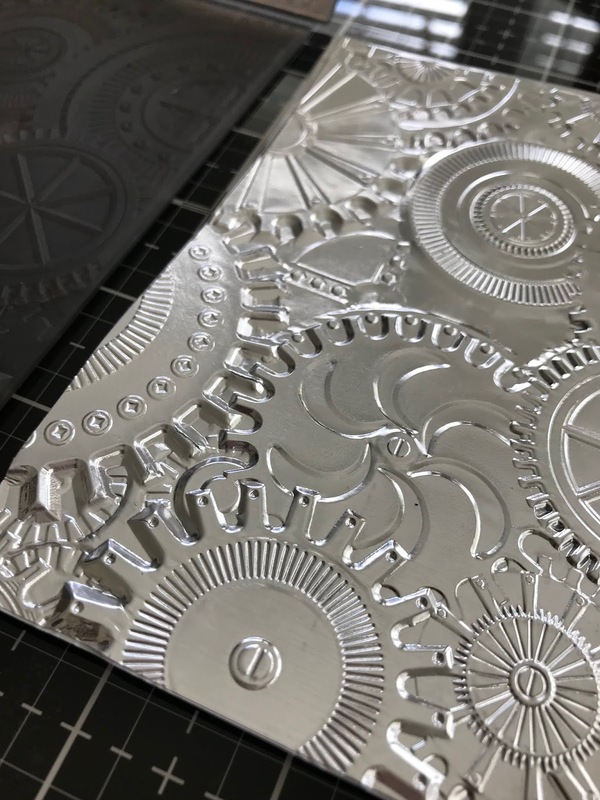 Once the 4 sheets are complete, cut them to the with of the clock body and begin to wrap each one onto the clock (this is my favorite part). Since the clock body is round you will need to cut slits on one edge to ease the foil around the clock body. Do not wrap the foil around the back of the clock or you may have problems getting the clock back on... well, you can probably get it on but you will never get it off to make adjustments! Trust me on this one. I used linen from the Textile Surfaces pack to cover the inside of the clock body. 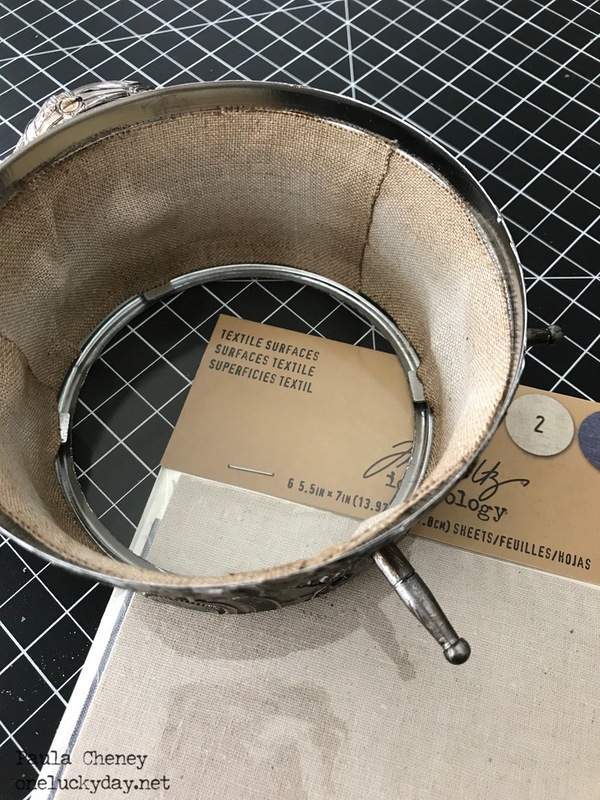 This is so easy because the linen is flexible so it can easily be adhered to the rounded surface (it's self adhesive too). I needed something to fill the bottom of the clock. I decided to use Baubles I had leftover from a Christmas project (seriously, you can never have too many of these). I used a few colors of Alcohol Ink to give the Baubles a faux "steel" look (no more pearls here!). 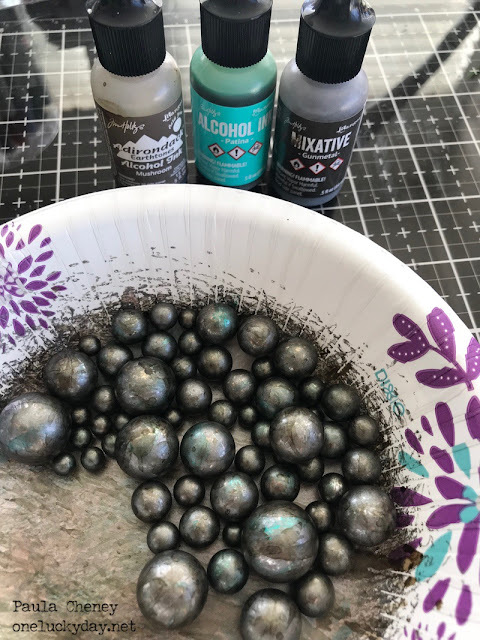 I did this by coloring all the Baubles with Gunmetal and letting them dry (I swirled them around in the paper bowl to keep them from sticking together during the drying time). 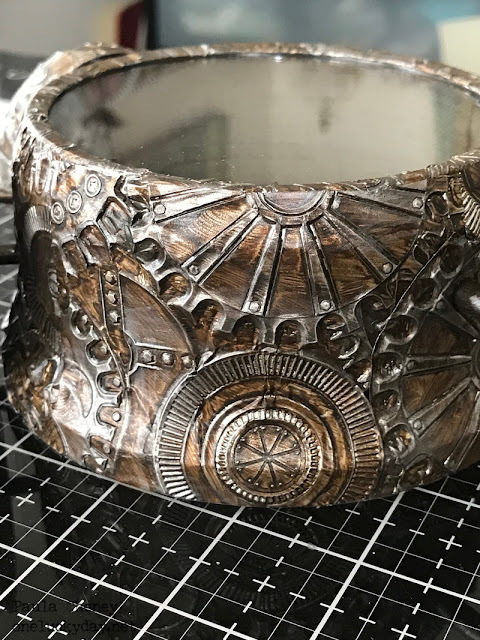 Once dry, I used a Blending tool with felt to randomly pounce Patina and Mushroom over the Gunmetal. I love to transform things with Alcohol Ink! Now just set aside till the clock is ready. The background of the Assemblage Clock has a patchwork of ephemera from the Collector pack. 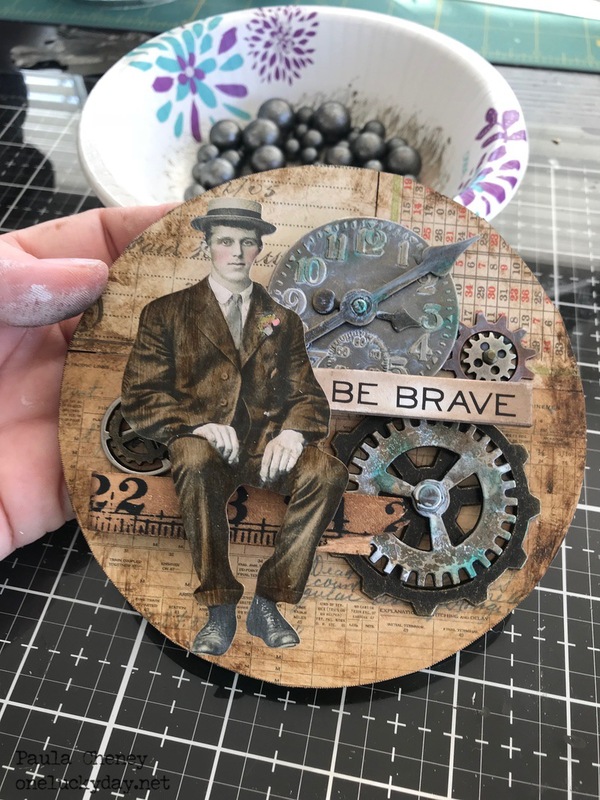 I just glued each piece to the surface with Collage Medium, then added a layer over the top to secure. Once the Collage Medium was dry, I rubbed Gathered Twigs Distress Crayon over the surface. I used one of my favorite sitting paper dolls for the centerpiece. I rubbed a VERY thin coat of Media Clear Gesso over the paper doll. Not only do the Distress Marker colors look richer over the Gesso, I think it holds the color longer. 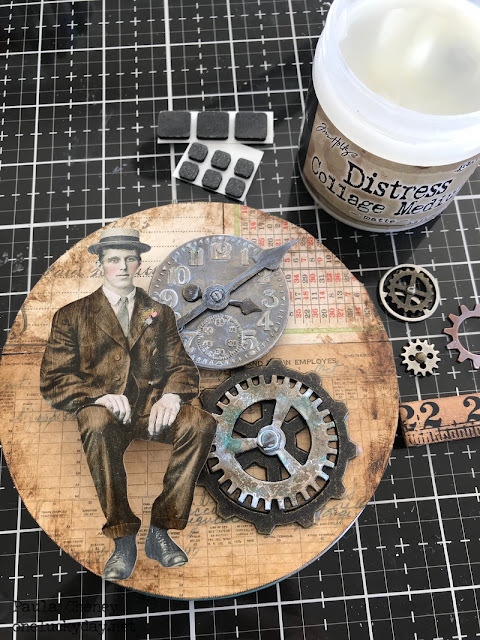 I talked about this Gesso technique in this post you may want to check out. 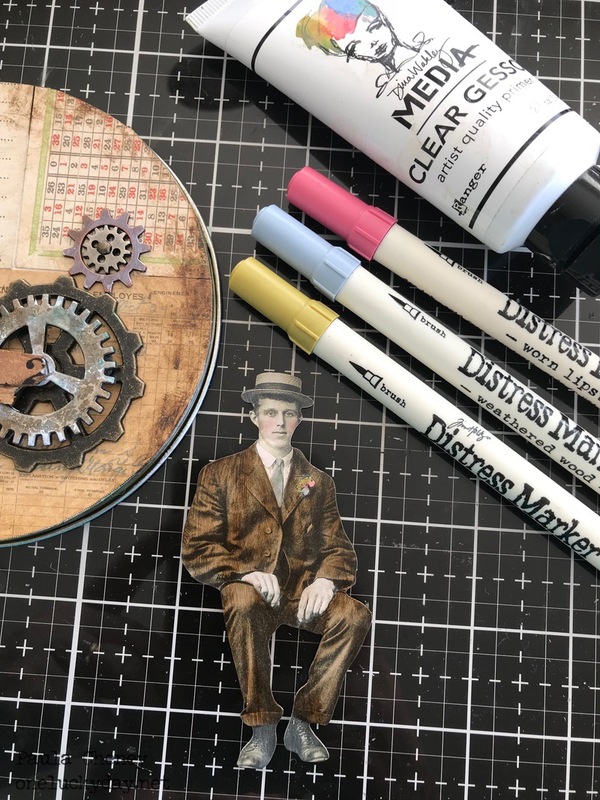 I colored multiple sizes of gears and a Timepiece with Picket Fence Distress Paint and used some of the same colors of Alcohol Ink as before. 1. The man has TWO bingo chips glued together so he is at the forefront. 2. The Timepiece has TWO stacked regular foam squares. Adding the multi-leveled layers allows you to add more pieces to the collage. First, I snapped off one of the Ruler Pieces to create a place for the man to sit. The ruler has two stacked foam squares on the left side and is glued directly to the Gadget Gears on the broken right end. 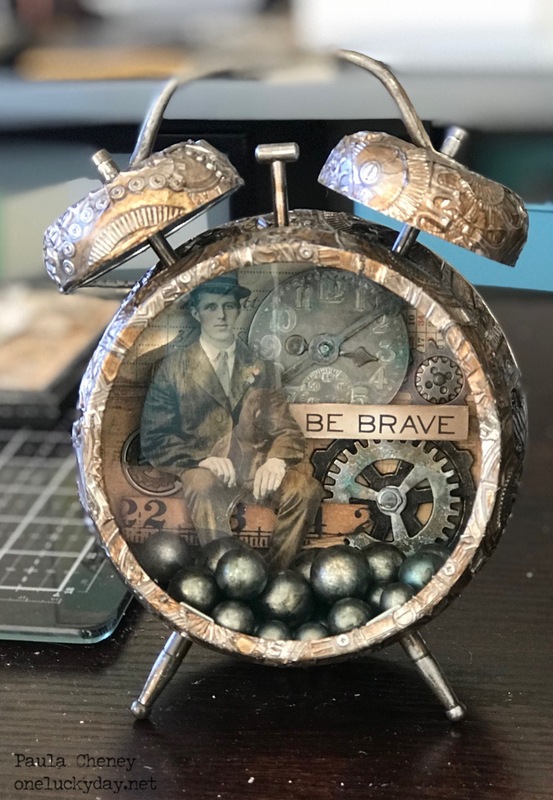 The Quote Chip "Be Brave" is glued directly to the bottom of the Timepiece. 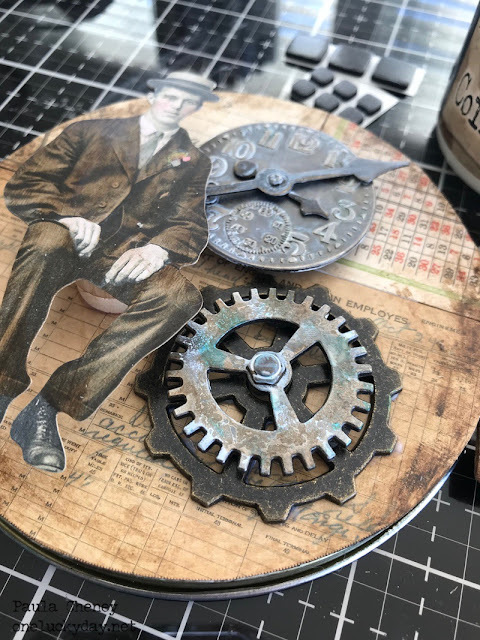 Once the collage was done, I added two more stacks of gears using Sprocket Gears, Mini Gears and the smallest size of Hex Fasteners. These were glued directly to the surface and tucked partially under the Timepiece and the man's elbow. The last thing to do is put it all together. Pour the Baubles into the clock, then add the back...making sure the man is sitting up straight. You could embellish the top of the clock with ribbon or trinkets but I decided to leave mine plain to showoff the 3-D texture on the outside. I hope you will give these new 3-D texture folders a try. They really are amazing! 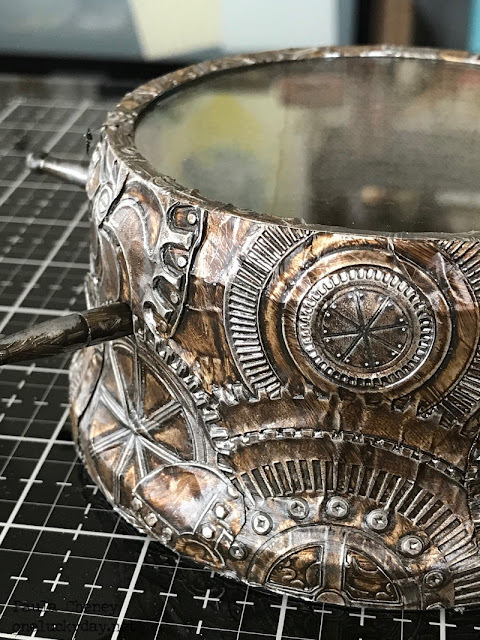 Awesome project and tutorial, Paula (as usual)! The swirly/alcohol ink bowl trick is such a good one and I have also used those bingo pieces for a support (they are smooth, flat, lightweight and just the right size). 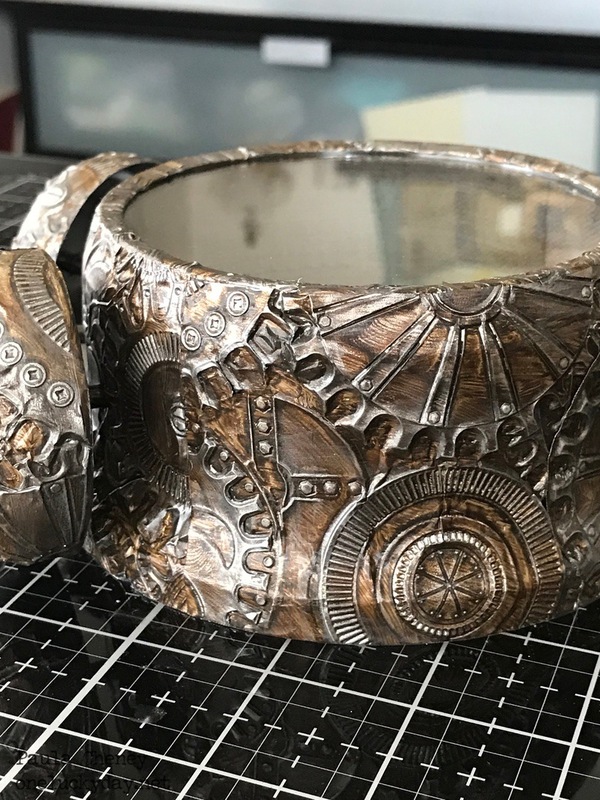 The adhesive-backed material is such a game changer for a project like this one. I've had fun playing with the Botanical 3D folder and it just can't be said enough--the level of detail is amazing! I don't know what I will do when I run out of bingo chips! Fabulous! I'm sorry I missed you this time around at The Crafty Scrapper but had a hand injury and couldn't make it, but I did get your fabric book kit to make later when I'm better. Hope to see you later in the year in Waxahachie! Sorry we missed you this time Katina! thank you Redanne! I had to watch it too to get all the tricks - didn't know them back when we were using the folders back in Jan.
WOW ... 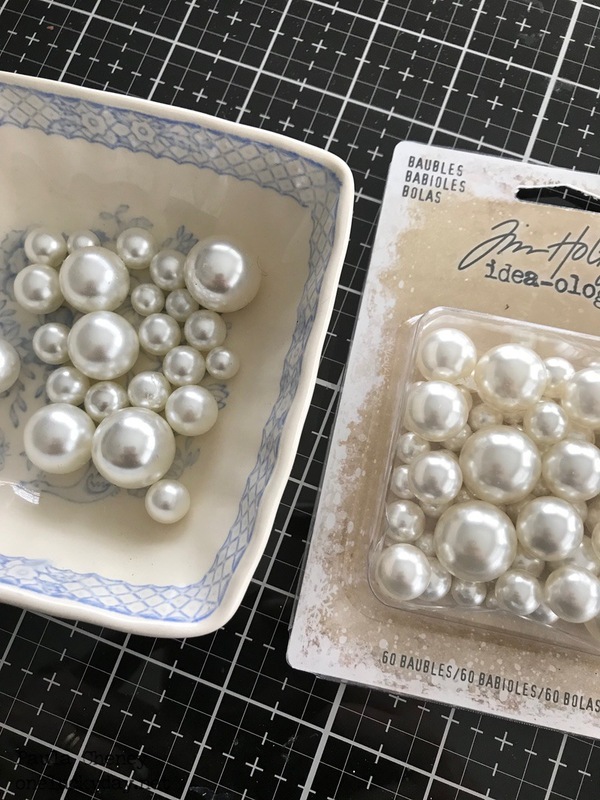 I was so giddy I forgot to mention love your technique with the baubles #coolballbearings !! Wow!!! This is really fabulous, Paula!!!!!! What an awesome piece! I just got one of the 3D folders and now I can't wait to use it. TFS Paula! LOVE this clock! You are so clever! ALWAYS love seeing you and your "sidekick" Patty at the Doodle! You are a well oiled machine! Can't wait for your return appearance in December. Such a great project paula!! Those 3D folders look like a must have! Super cool clock! 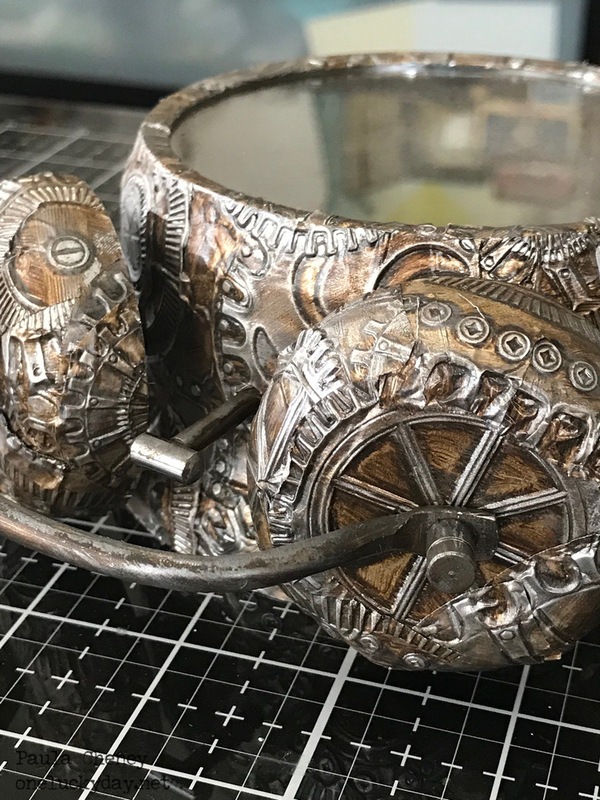 A lot of work went into that and it turned out awesome!